How can the VP/HR raise awareness and stand in solidarity with Ola? In what ways can the VP/HR encourage the Egyptian government to drop the charges and set her free? 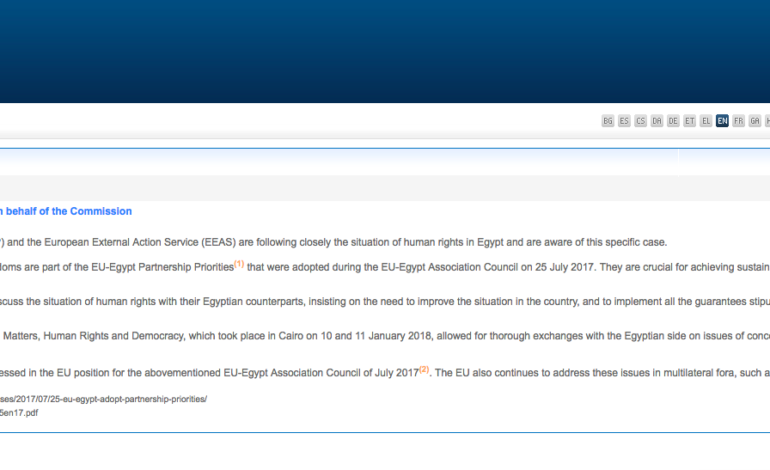 “The High Representative/Vice-President (HR/VP) and the European External Action Service (EEAS) are following closely the situation of human rights in Egypt and are aware of this specific case. Democracy, human rights and fundamental freedoms are part of the EU-Egypt Partnership Priorities(1) that were adopted during the EU-Egypt Association Council on 25 July 2017. They are crucial for achieving sustainable stability, especially in the context of the challenges that Egypt is facing. On this basis, the HR/VP and EEAS regularly discuss the situation of human rights with their Egyptian counterparts, insisting on the need to improve the situation in the country, and to implement all the guarantees stipulated by the 2014 Constitution and Egypt’s international obligations. The recent EU-Egypt Sub-committee on Political Matters, Human Rights and Democracy, which took place in Cairo on 10 and 11 January 2018, allowed for thorough exchanges with the Egyptian side on issues of concern, including long pre-trial detention and poor prison conditions. This is a positive step towards gathering the support of governments around the world to push for the release of Ola and Hosam.